A failed photo transfer attempt resulted in an empty black canvas. 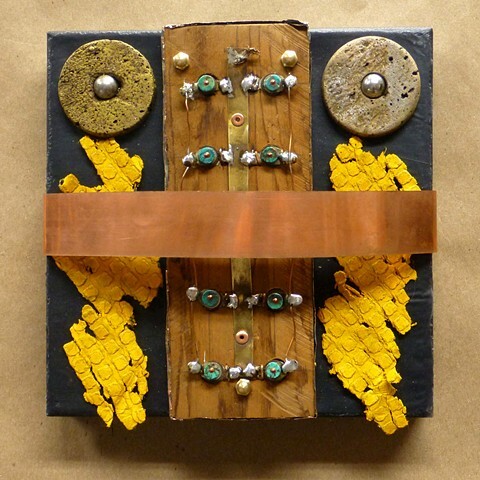 I responded by attaching a paper thin copper strip across the middle, then inserted an enhanced piece from a salvaged contraption (see Mr. Nelson's Box in this gallery) and a couple of cork float cross sections with steel ball bearings. The finishing flourish comes from a couple of pieces of yellow street reflector scraps that were found after a snowplow scraped up the almost-new layer put down only the summer before.